By building the largest magnetic ball accelerator in the world, Johannes Gutenberg University Mainz (JGU) set a new world record officially recognized by Guinness World RecordsTM on 11 June 2017. The ball accelerator with a total length of 546 meters — alluding to the date of the reopening of Mainz University in May 1946 — was constructed on the streetcar rails that run next to the campus and here produced a chain reaction caused by magnetic forces. Fundamental physical principles underlie the chain reaction concept employed: magnetic forces are used to accelerate the speed of rolling steel balls; by exploiting the transfer of momentum between the accelerated balls, a reaction similar to a domino effect can be generated, which — once triggered — can continue over many hundreds of meters. This world record takes up aspects of the research being undertaken at the JGU Cluster of Excellence PRISMA and the MAINZ Graduate School of Excellence and presents basic physics concepts in a popular scientific demonstration. 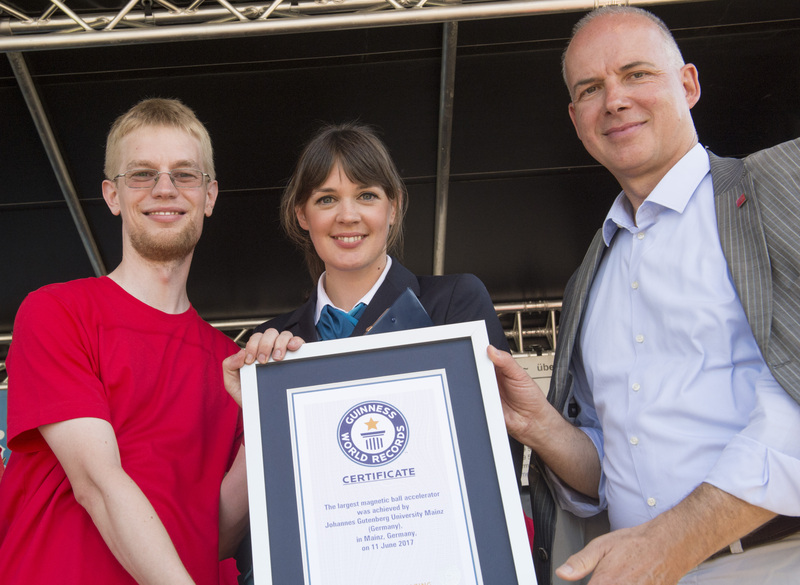 The Guinness World Records experiment was organized by PRISMA and realized in cooperation with two high schools in Mainz, namely the Rabanus Maurus Gymnasium and the Otto Schott Gymnasium. The record event took place under the patronage of the Rhineland-Palatinate Minister of Education, Dr. Stefanie Hubig, and the Minister of Science, Continuing Education and Culture of Rhineland-Palatinate, Professor Konrad Wolf. "Thanks to the success of our world record attempt, Johannes Gutenberg University Mainz is now not only the holder of an official Guinness World Records title but has also once again stimulated the interest of the wider public in science and research, in particular in the fields of accelerator physics and magnetism," emphasized the President of Johannes Gutenberg University Mainz, Professor Georg Krausch. "I would particularly like to thank all those who have worked zealously for weeks and months on the implementation of the experiment and on the realization of a colorful framework program for visitors of all ages. Many thanks to the students of the Rabanus Maurus Gymnasium and the Otto Schott Gymnasium, who were here very early today to set up the accelerator. Furthermore, we owe special thanks to the association of the Friends of Mainz University for their very generous support of our record attempt as well as to Mainzer Verkehrsgesellschaft, MVG in short, for allowing us to use the streetcar rails," added Krausch. The idea for this world record attempt came up last summer at the JGU Cluster of Excellence on Precision Physics, Fundamental Interactions and Structure of Matter (PRISMA), which is currently being funded through the Excellence Initiative of the German federal and state governments. "PRISMA is one of only two clusters in Germany dedicated to conducting research into basic questions about the nature of the fundamental building blocks of matter and their relevance to the physics of the universe," explained the PRISMA coordinators, Professor Matthias Neubert and Professor Hartmut Wittig. Within the framework of PRISMA, physicists are undertaking experiments using the accelerator facilities at Mainz University and in connection with major international projects. "In addition to our cutting-edge research in the fields of astroparticle physics, high energy physics, hadron physics, nuclear chemistry, and precision physics with ultra-cold neutrons and ion traps, we also focus on attracting the next generation of excellent young researchers. This is why PRISMA hosts various programs for high school students dealing with physics-related topics and why we also decided to organize this Guinness World Records title attempt in cooperation with two high schools here in Mainz." Another important topic in the record experiment was magnetism, a field of research that the MAINZ Graduate School of Excellence concentrates on. With its PRISMA Cluster of Excellence and the MAINZ Graduate School of Excellence, Johannes Gutenberg University Mainz takes a leading international role in research into particle physics, hadron physics, and material sciences. "Our world record ball accelerator was constructed at JGU and built in the mechanical workshop of our Physics institutes. 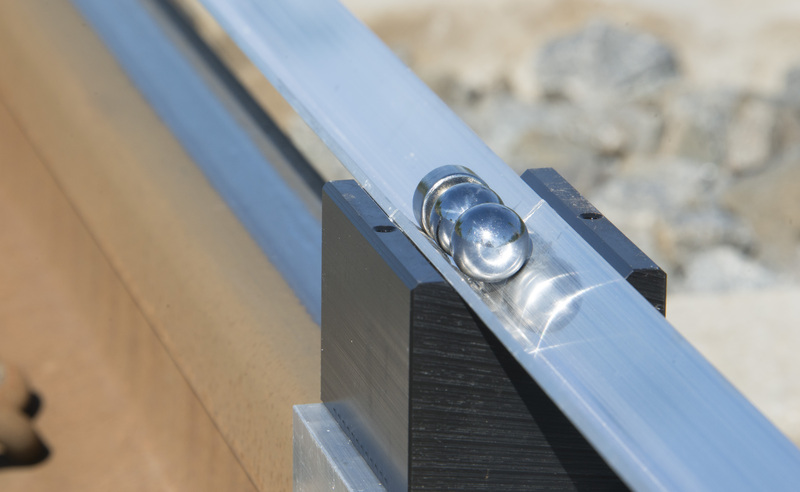 Various details had to be taken into consideration, such as the individual expansion of the six meter long aluminium profiles we put on the rails when exposed to strong solar radiation and the like," explained Dr. Christian Schneider, who is responsible for the PRISMA programs for high school students and headed the world record project team. "The accelerator with its 700 steel balls and 350 magnets, which was installed by a group of motivated high school students early this morning over a stretch of 546 meters, will now be cut up into sections and the various segments with balls and magnets will be distributed among local schools. They will then be able to use them for their own physics experiments." Various physics groups of Mainz University offered lab tours and talks on their research as well as hands-on experiments and information booths accompanying the world record event. Nearly 250 visitors took advantage of the tours presenting, for example, the MAMI particle accelerator and the labs of the Quantum Physics, Ion Physics, Particle Physics, and Astroparticle Physics groups and gained insight into basic physics research at JGU. Johannes Gutenberg University Mainz set a new Guinness World RecordsTM record with the largest magnetic ball accelerator in the world. 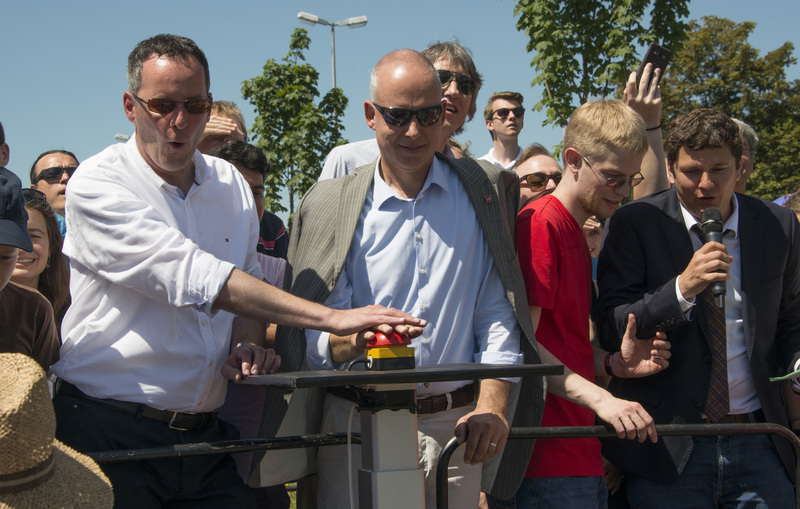 The President of Mainz University, Professor Georg Krausch (2nd from the left), and the Mayor of Mainz, Michael Ebling (l.) started the world record experiment by pushing the start button. 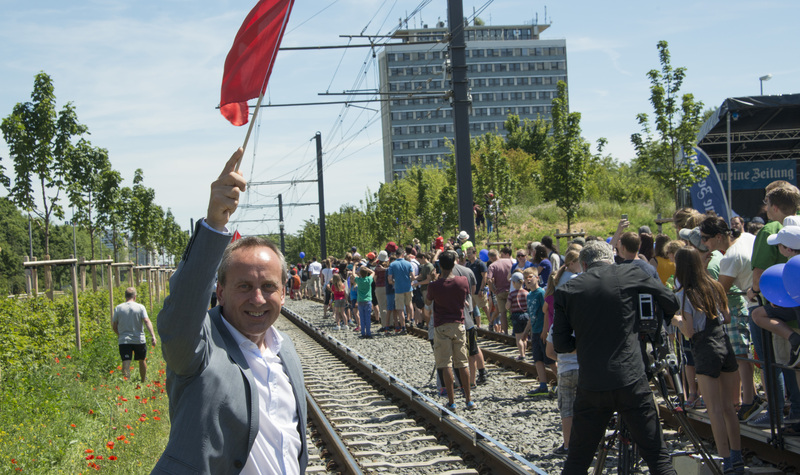 Minister of Science Professor Konrad Wolf checked the first control point and waved a red flag when the chain reaction had passed his track section. 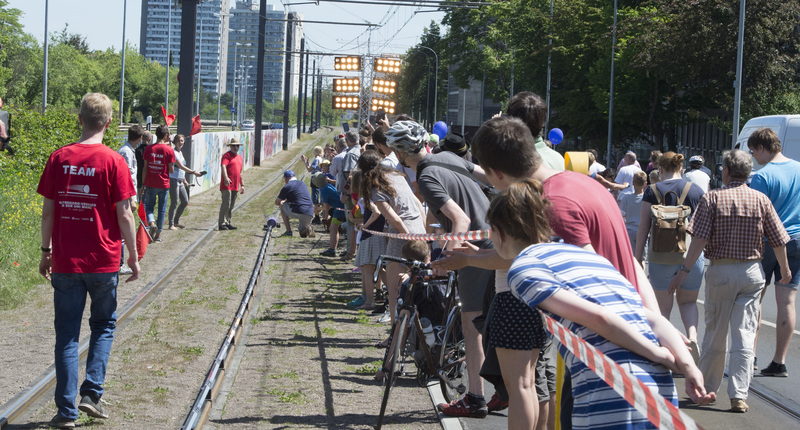 Some 500 enthusiastic spectators gathered along the 546-meter record stretch. Officially amazing: Guinness World Records judge Lena Kuhlmann (center) awarded the official certificate to JGU President Professor Georg Krausch (r.) and project director Dr. Christian Schneider (l.).